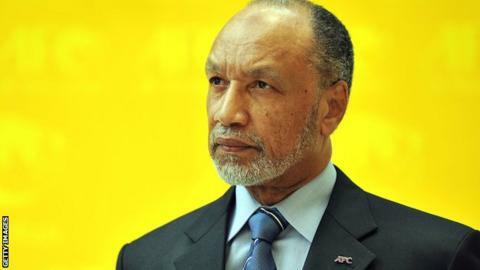 Former Fifa presidential candidate Mohamed Bin Hammam says he wants to retire from football despite having his lifetime ban for bribery annulled. Fifa had banned him from "any kind of football-related activity at national and international level for life". But the Court of Arbitration for Sport (Cas) said there was insufficient evidence to support the ban. "My wish now is just to quit and retire," he told BBC's World Football programme. "I've served football for 42 years - this last year I have seen a very ugly face of the sport and of football. "I should have the benefit of the doubt." Bin Hammam was accused of attempting to buy votes ahead of last year's Fifa presidential election. Despite anulling the ban, Cas stressed that its decision did not make any sort of "affirmative finding of innocence in relation to Mr Bin Hammam". "The panel is doing no more than concluding that the evidence is insufficient in that it does not permit the majority of the panel to reach the standard of comfortable satisfaction in relation to the matters on which the appellant was charged," the report said. Fifa said it noted Cas's decision "with concern", and added that Bin Hammam would remain suspended until a separate disciplinary investigation by the Asian Football Confederation was completed. Bin Hammam, 62, along with former Fifa vice-president Jack Warner, was suspended after a leaked report revealed four Caribbean Football Union (CFU) associations were either offered money, or saw the incident occur, during a meeting last May. It was alleged that cash-stuffed envelopes containing up to $40,000 (£25,000) were handed to the delegates during the meeting in Port of Spain, Trinidad and Tobago. A Fifa report said there was "comprehensive, convincing and overwhelming" proof that bribes had been paid to officials to support Bin Hammam's campaign for the presidency, and that Warner had facilitated this. Bin Hammam, a former head of the Asian Football Confederation, withdrew from the election, leaving Sepp Blatter to be re-elected unopposed. Warner later resigned from Fifa so his case did not go before the organisation's ethics committee. Outlining its decision to annul the ban, Cas, in its report, said: "This conclusion should not be taken to diminish the significance of its finding that it is more likely than not that Mr Bin Hammam was the source of the monies that were brought into Trinidad and Tobago and eventually distributed at the meeting by Mr Warner. "In this way, his conduct, in collaboration with and most likely induced by Mr Warner, may not have complied with the highest ethical standards that should govern the world of football and other sports. "The panel therefore wishes to make clear that in applying the law, as it is required to do under the Cas Code, it is not making any sort of affirmative finding of innocence in relation to Mr Bin Hammam. "It is a situation of 'case not proven', coupled with concern on the part of the panel that the Fifa investigation was not complete or comprehensive enough to fill the gaps in the record." Cas said it would be possible to re-open the case with Fifa's ethics committee if new evidence was presented. Fifa said: "All relevant files will now be handed over to the new Fifa ethics committee [which] will then decide, based on the reports and evidence presented to it, if any action is required to be taken against Mohamed Bin Hammam."